It was known that a transport plane with nurses and medics had crashed in Nazi-held Albania and that they had been rescued. It was not known what happened in between. The details of that journey were kept secret until the 1990s when Communism crumbled in Albania and the brave people, who risked their lives to help the Americans, were no longer at risk. This is a heartpounding story of courage under harrowing circumstances and one that no will forget. A #1 Wall Street Journal e-book bestseller! This mesmerizing account of the courage and bravery of ordinary women and men reveals for the first time an astonishing true story of heroic struggle and endurance. When twenty-six Army Air Force flight nurses and medics boarded a military transport plane in November 1943 on a mission to evacuate wounded and sick troops, they didn't anticipate a crash landing in Nazi territory. Emerging from their battered aircraft, the Americans found themselves in Albania, a country rife with chaos and danger. With hunger and sickness as their constant companions, they hid at night with courageous villagers who shared what little food they had, risking death at Nazi hands by doing so. For months, they prayed desperately to be rescued while doing everything they could to survive. Cate Lineberry is a former staff writer and Europe editor for National Geographic and the web editor of Smithsonian, and her work has appeared in the New York Times. She lives in the greater Washington, DC, area. 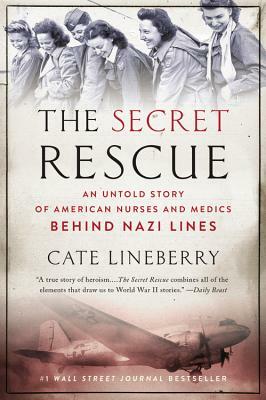 "The Secret Rescue by Cate Lineberry is a true, adventure-packed, World War II escape saga, impeccably researched and beautifully written. It is a Five-Star must read." -- Major Jon Naar, Special Operations Executive, responsible for coordinating intelligence gathering and dissemination during the rescue operations.